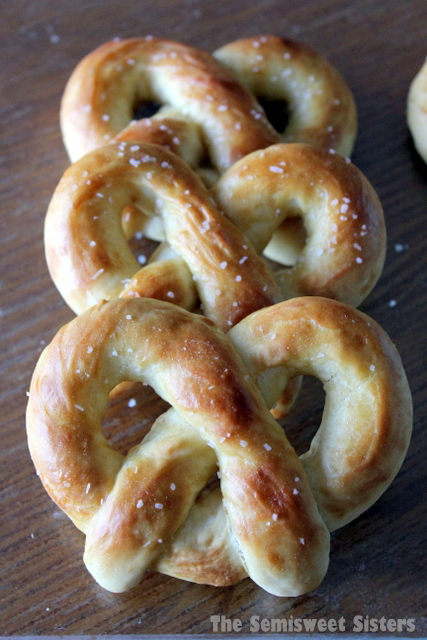 A copycat recipe for those famous mall pretzels that are so hard to resist! So I’ve been craving pretzels for weeks but haven’t been able to find the time to make them until now. My sister & I made these together because last time I made them mine didn’t turn out very photo worthy. My sister is much better at rolling our the pretzel dough than me. I couldn’t figure out why mine always turn out thicker looking. After watching my sister roll out the dough we think that the trick is to roll the dough forward with the palms of your hands then bring it back, roll it forward again, until it gets about as thin as a pencil. Also DON’T use flour to roll out the pretzels, use oil! It works great, seriously! 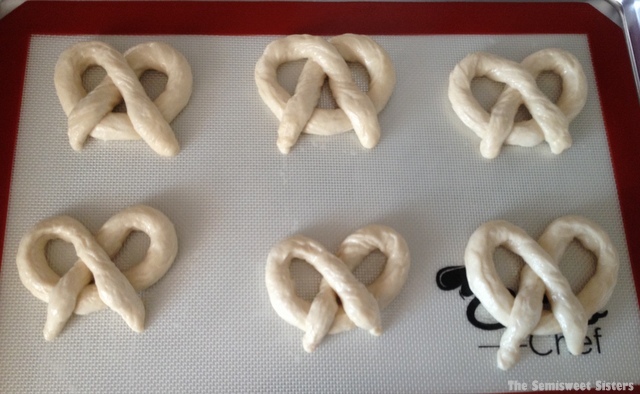 If you want Auntie Anne size pretzels then this recipe makes 6 big pretzels. However this time we decided to make ours a little smaller so we ended up with 12 pretzels. I think this recipe tastes pretty close to the real thing, I have 2 different recipes I use to make copycat ones but I love this version because it’s quicker! If your wanting something sweeter these taste really good sprinkled with cinnamon & sugar instead of salt! They reminded me of elephant ears that they sell at fairs. They are probably like the Auntie Anne’s cinnamon & sugar pretzels but I’ve never had one of those. *If you don’t want to knead the dough by hand you can just pour all the ingredients into a bread machine or a stand mixer fitted with a dough hook & let it knead for about 5 minutes. Divide dough into 6 pieces. Use a lightly oiled surface to roll and stretch each piece with the palms of your hands into a 30-inch rope. Form each rope into a pretzel shape. Melt the remaining 4 tablespoons butter in a shallow dish. Brush pretzels with butter or dip them in the butter. Sprinkle with coarse salt. Recipe adapted slightly from Food Network. 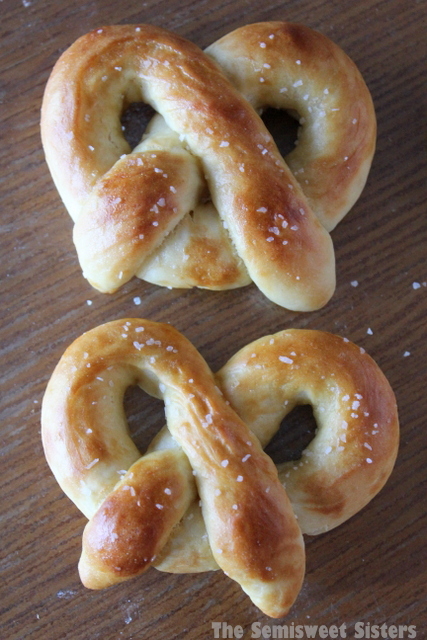 I love making pretzels, but mine never come out this pretty! Can’t wait to try this recipe! Hi!! I love Auntie Anne’s!!! But I was recently moving to NZ and there’s no AA here. So glad I’ve found your recipe! Just 1 question, can I freeze it and reheat it for later? Because there’s only 2 people in the house and I don’t think I could eat it all together. Thank you! best recipe ever! And the dough was very soft and sticky and i just added enough flour to make it work, they came out perfect. Hi Jackie, I’m so glad you liked the recipe! Sometimes I have to add more flour or liquid depending on the time of year. Thanks for commenting! I can’t wait to try this! Would I put the bread machine on dough setting or just let it knead in the machine for 5 minutes? Hi Blair, My house is pretty warm inside so I unplug my bread machine after 5-10 minutes. If your house is cool then you can let the bread machine run on the dough cycle, it will help it to rise & stay warm.